Harold Ekeh scored the home run of college admissions. He was accepted by every Ivy League school this year as well as MIT and Johns Hopkins. 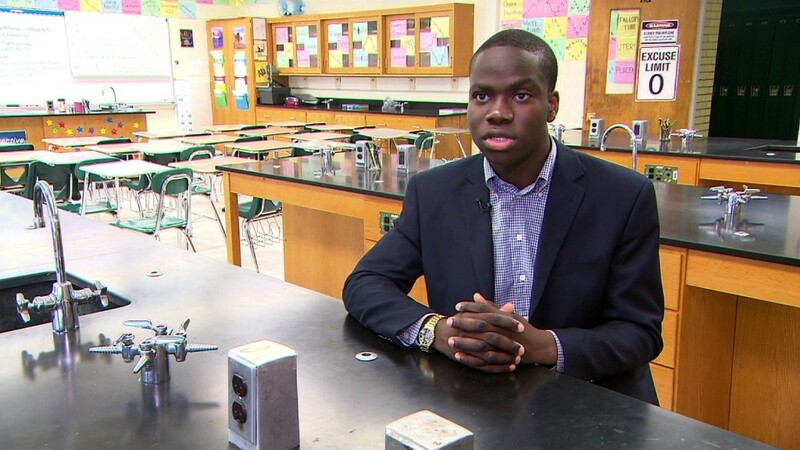 The 17-year-old from Long Island, New York starts at Yale University at the end of August with plans to major in molecular, cellular and developmental biology. These days he's chatting on Facebook (FB) with his college roommate, sleeping in and walking around the house in his new hiking boots for a Yale camping trip. How did you do it? Can you help me? Can you help my nephew? So Ekeh published an e-book entitled "Hacking College Admissions" with Victor Agbafe, a teen from North Carolina who also got into all the Ivies. Agbafe will be a freshman at Harvard this fall. "People ask me all the time: 'how did you do it?' I wanted to be able to provide a more substantial answer," Ekeh told CNNMoney. They partnered with the Frog Tutoring company. For every book sold, they are donating one to an underprivileged student. The biggest tip: Start early. Literally. Both men would begin their days by 5 a.m. during their senior year in order to get more work done. "I have a 'do it now' mindset," says Ekeh. He is mentoring other students from his public high school and the biggest mistake he sees is that people procrastinate -- whether it's delaying studying for a test or waiting too long to start writing their college essays. The two Ivy Leaguers also stress that you have to start getting serious in middle school. Take more and more advanced courses as early as possible. And start applying for scholarships in your junior year -- or even earlier. Want more tips? Here are the top 5 from what Ekeh shared with CNNMoney along with those from the book. 1. If you haven't started your college essay already, you're behind. Ekeh's largest regret in his own process was that he didn't really get going on his essays until October. He wished he had started in August. Even just jotting down notes can make it easier. A lot of times it's just about getting that great first line that really makes the essay flow. Ekeh started his essay by describing the moment his mother told the family that they were moving from Nigeria to America. He was 8 at the time. 2. Prepare not to sleep a lot your senior year. Ekeh and Agbafe describe days that would start by 5 a.m. and end around midnight. Between school, clubs, homework, athletics and family dinner, there isn't much time for college applications. That's why you have to start earlier. Ekeh says stop hitting the snooze button. The key is getting up right away and walking around the house -- or even outside -- for a few minutes to get the blood flowing. 3. Don't just Google colleges. Visit them. A lot of schools ask applicants: Why Yale? Why Harvard? Why us? It's a lot easier to answer that if you've been to the college campus. Ekeh wishes he had realized sooner that many universities will give low-income students aid to visit their campuses. They know it's a financial burden to get there. But if you email a school and say you are really interested, they often do what they can to make it happen. Take the initiative. It helps you decide -- and makes your application stronger. 4. Do at least 1 extracurricular that isn't obvious. Ekeh wants to be a neurosurgeon. Most of his after-school activities focused on science and research, but one of his most life-changing experiences in high school was joining Model United Nations. He learned to become a better researcher and public speaker, and he participated at a Model UN conference at Yale University, which led him to apply there and connect with current Yale students who became his mentors. While being focused in high school is good, taking some risks in your activities often makes you stand out. 5. Seek help. Many college students are willing to mentor you. There are over 65 million Americans now with a college degree (about 30% of U.S. adults). While the college application process can seem daunting, many people have done it before. Find them. Connect with them. Ask for help. Ekeh reached out to current Yale students and former alumni of his high school who had been accepted to top schools. He asked them to read his essays and give him feedback. Now he is trying to help others. Many colleges also have Facebook pages for applicants where current students offer to help, even if you don't know them.